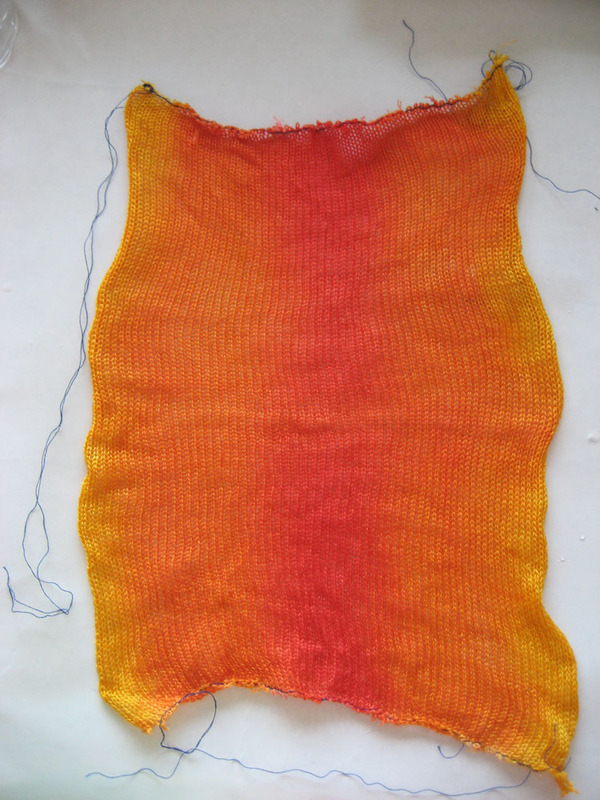 I dyed the second half of the knitted blank yesterday, and wove up part of it on my lunch hour.Â This one I did not do in regular stripes, instead I did it in blobs of color. You can see some sections where shots of red are alternating with shots of yellow, and it’s a little disruptive, but because the overall pattern is fairly “busy” to start with, it isn’t super obvious.Â Instead it appears as a Monet-like texturing of the color. I like this approach a lot better – there’s more variation and it’s more interesting.Â It’s also something that can only be done using a knitted blank, whereas I realized (after the fact) that the first blank (stripes) was only mimicking what could be done with a handpainted skein if you got the length of the skein right.Â Notice how much more organic the color flow is in the second version, whereas it is very regular, almost rigid in the first version! 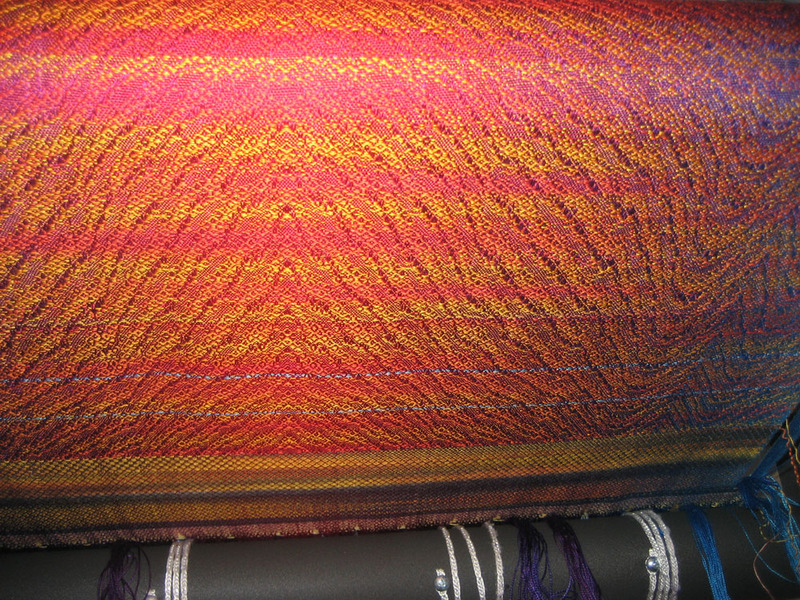 Not that that is necessarily bad – just not what I wanted for this shawl.Â I do plan to weave up another shawl in pattern #1, against a black background, with an undulating twill pattern, and call it “Tiger Stripes”.Â I think woven up that way, it will be VERY attractive. 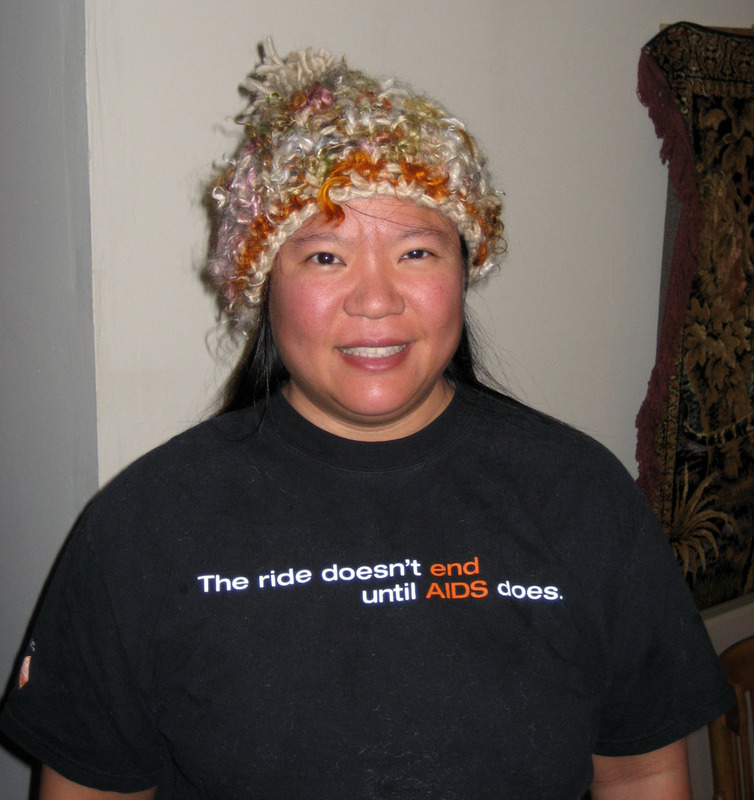 When I arrived in Maryland, it was in the high thirties or low forties and windy as we came out of the airport.Â Within seconds, my ears were freezing. I was still really cranky and stressed out this morning, so after a few hours of me stomping around the house, Mike suggested that I find something fun to do, to relax. 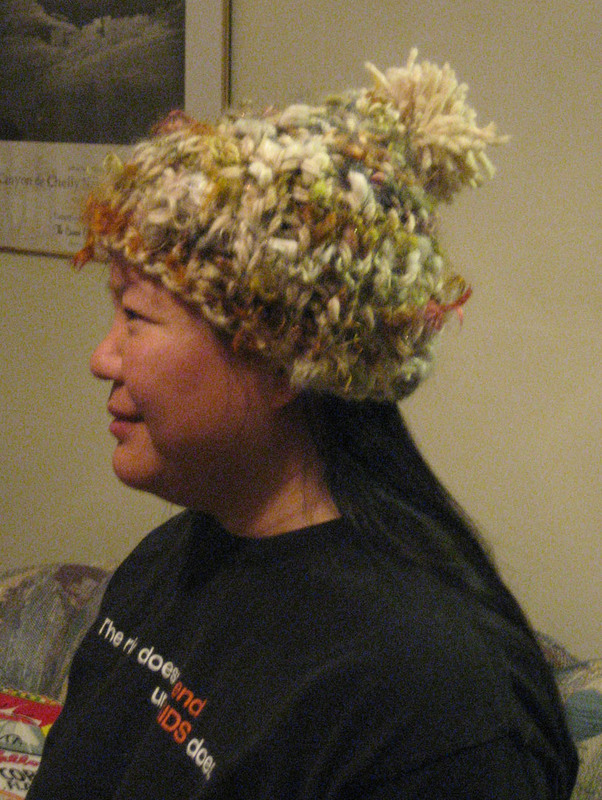 He also suggested that I investigatewhy I was being cranky, since this is radically out of character for me.Â Exercise, stress, seasonal affective disorder…nope.Â I concluded it was fiber withdrawal.Â With my loom “in the shop” for another 2-3 weeks (according to AVL), I haven’t been doing anything at all related to fiber or yarn for the last few days/week, and fiber arts is extremely calming for me. 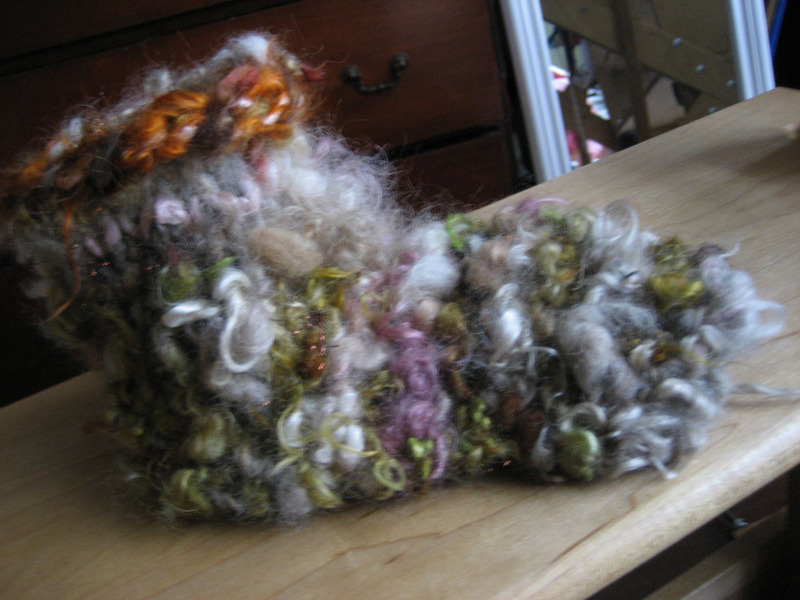 Top of a slipper knitted from funky handspun yarn. It was quick, relatively mindless (since I “winged it” on the design and didn’t worry about reproducibility), and oh-so-satisfying to be working with yarn and fiber again.Â I’m really looking forward to knitting the other one, and putting in the soles.Â I will have warm feet, FABULOUS slippers, and I will be blissfully un-cranky again.Â What’s not to like? So, I received my sock blanks from Knitpicks today.Â I’m excited – this is a wholly new concept, and I’m glad someone invented it.Â Basically, it’s a long rectangle of knitted fabric, done with two strands held together.Â You dye the sock blank however you like, unravel it, knit from the unraveled yarn, and lo! you have two socks with patterns that match precisely. 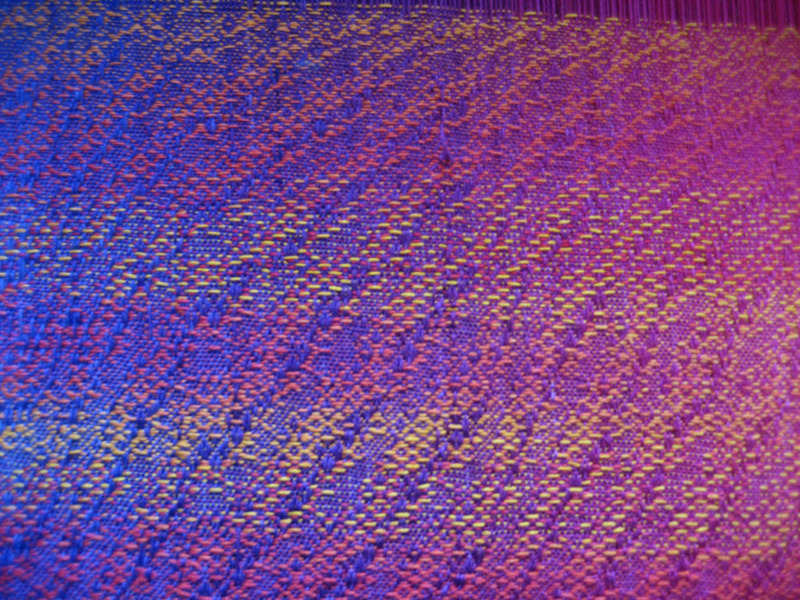 You can do all sorts of interesting patterns – Knitpicks actually has a tutorial on the different dye patterns you can do (warning: it’s 3MB, so don’t click on the link unless you have a fast connection or a LOT of spare time on your hands).Â I personally want to see if I can do gradated dyeing from pink to turquoise in vertical stripes (with smooth color blending) – and see what happens.Â Since this is back and forth flat knitting and not knitting from a round skein, I doubt I’ll get a spiral, but I can’t really envision what I’ll wind up with.Â Which is why I must try it! 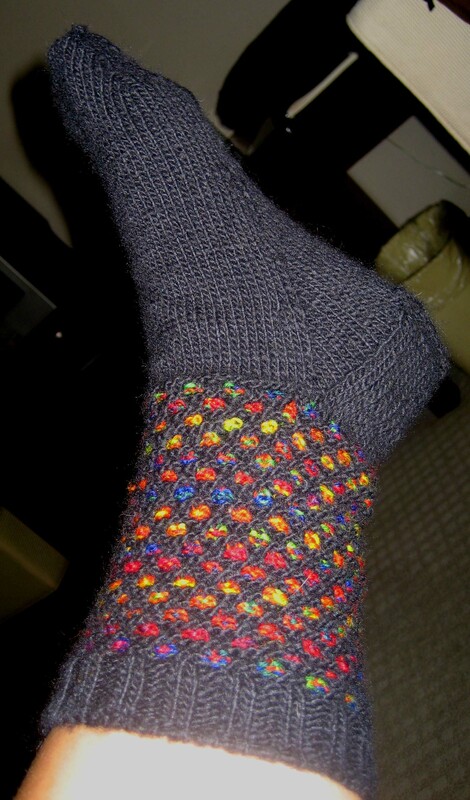 However, this is mostly a theoretical exercise – I don’t have time or inclination for sock knitting right now, it was the new concept that intrigued me into buying them. I’ll probably dye them sometime in the next month or so and put off knitting the socks until the next time I go traveling, or need something portable. Meanwhile, my head has been exploding recently, and I’ve concluded it’s because I’m trying to do too much analytical work at once.Â The PHP/MySQL thing is proving extremely complex, more than I can really handle after a long day at work. So I’ve been beating my head against the wall, which is not fun and needs to stop. Soo…I have decided to remand PHP/MySQL to the weekends, when I can devote half a day to deep concentration.Â During the week I’m going to work on the web redesign and various craft projects, with weaving and beading at the top of the list.Â I’ve ordered Gwen Fisher’s Lotus Beaded Bead and Sea Star bead patterns, and a few books on beading should be arriving shortly.Â I’m also planning to start moving my weaving project along again, though I expect (what with everything else) it will go fairly slowly. 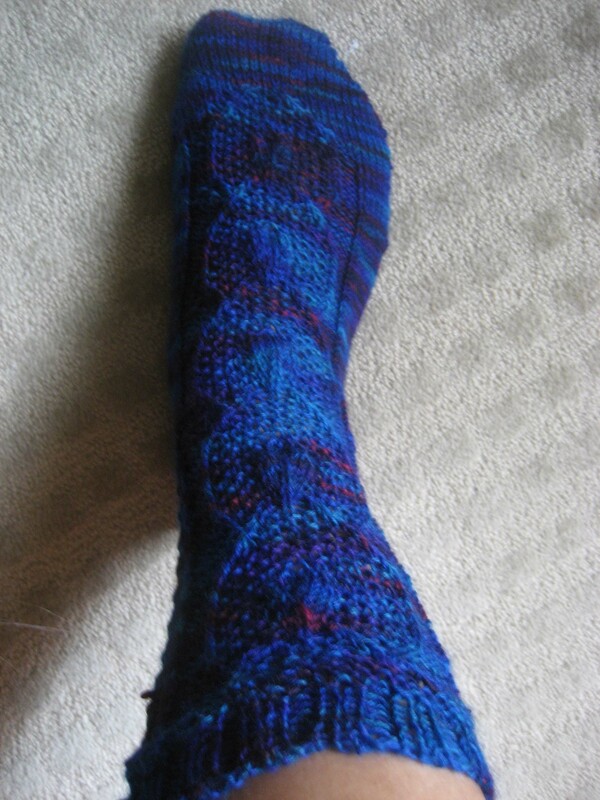 I’m about 3/4 of the way through the second blue sock now, and will start the other rainbow sock as soon as I finish that one.Â Since I don’t expect to have a whole lot of time left in my trip (I fly home tomorrow), I expect it will be a total of three pairs of socks for the trip. I think in the future I will stick with solid colored yarns or else use the multicolors as in the rainbow sock.Â With multicolor yarns, the pattern really doesn’t show up as clearly as I’d like, being dominated by the color changes (esp. at a distance). Regardless, they’re neat socks.Â I like ’em.